I love making things myself! It doesn’t matter if it’s DIY decor, homemade beauty products, or food, I just really enjoy making things from scratch. It doesn’t hurt that taking the DIY route is also a great way to save money! And making my own food staples gives me peace of mind, knowing that at least some of the food in my fridge and pantry are safe from being part of a recall. 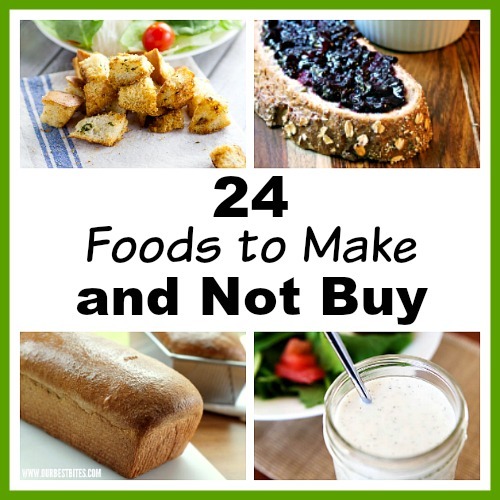 If you’d like to start making more foods yourself, here are recipes for 24 Foods to Make and Not Buy. Homemade foods taste so much better than store-bought versions! And they are often healthier (or at least missing food coloring and weird additives)! Most things you can make using the kitchen appliances you already have. But after years of making many of the things on this list of foods to make and not buy, I must say that having the right gadgets can make the experience a lot easier. And the easier it is to create these food staples, the more likely you’ll keep making them over the years, rather than just giving up and going back to the grocery store. In particular, a bread maker makes creating fresh-baked bread a breeze, a food processor is a must for any complicated chopping/mixing, and an Instant Pot is just overall handy (you can make dinner in it, or even vanilla extract)! Have you ever made any of these foods to make and not buy?